Published on June 18, 2008 in screenings other than TLC. 0 Comments Tags: Film events. An evening of music and film presented by Ensemble Offspring, Wed 25 June 2008 at the Chauvel, Paddington. 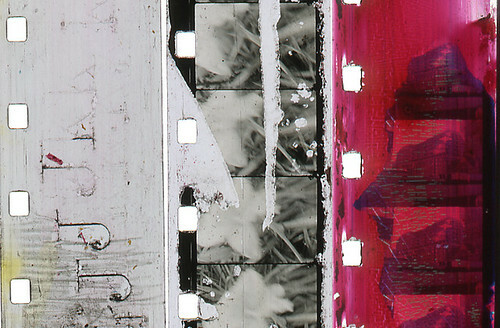 Waiting To Turn Into Puzzles is a new super 8 film work by Louise Curham featuring hand processed and hand-made film. Frames from the film have been scanned and printed, literally the ground for a new composition by Melbourne composer David Young for a performance by Sydney’s fabulous Ensemble Offspring. ‘WTTP is a cinematic experience with live music. Curham’s hand-processed, etched and looped super 8 films are simultaneously an intense visual experience and music notation for Ensemble Offspring. David Young ascribes a vocabulary of musical gestures to the textures, colours and shapes of the projections through a process of composition that explores the continuum between improvisation and notated music. David’s music has been likened to the ‘aural equivalent of seeing a world in a grain of sand’. The evening commences with drinks in the Chauvel foyer with a screening of Bill Morrison’s ‘Light is Calling’ and is followed by more drinks in the Chauvel foyer. From this material, Louise scanned and printed frames of the film to create the ground for a score composed by Melbourne’s David Young. The work will be performed by Sydney’s Offspring Ensemble.